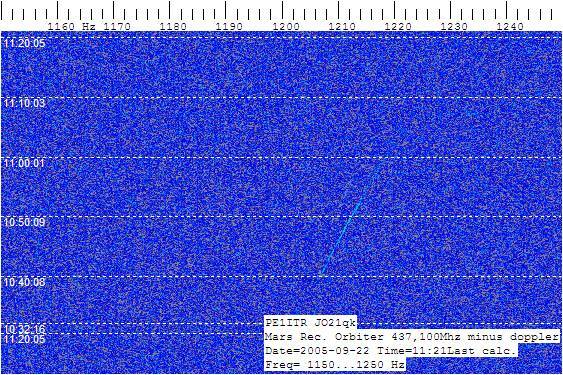 This report documents the reception by PE1ITR of the UHF test from the Mars Reconnaissance Orbiter (MRO) spacecraft on september, 22 2005. The spacecraft was launched on august 12, 2005 and at the time of the tests, the spacecraft was in interplanetary cruise over 14 million kilometers from Earth. 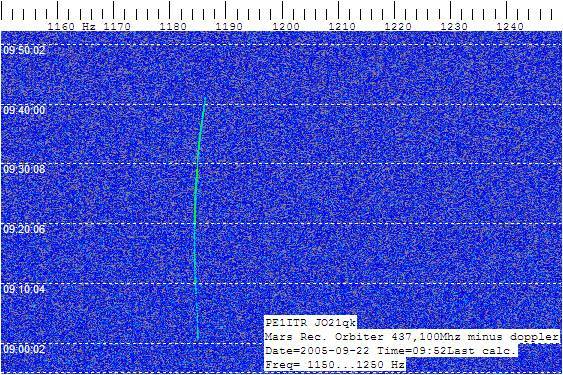 The signal was transmitted at 437.100MHz from the Orbiter. The signals where continuous wave (CW) and the transmit power was approximately 10 watts. The antenna at the spacecraft was right circular polarization with a gain of 0 dBi. 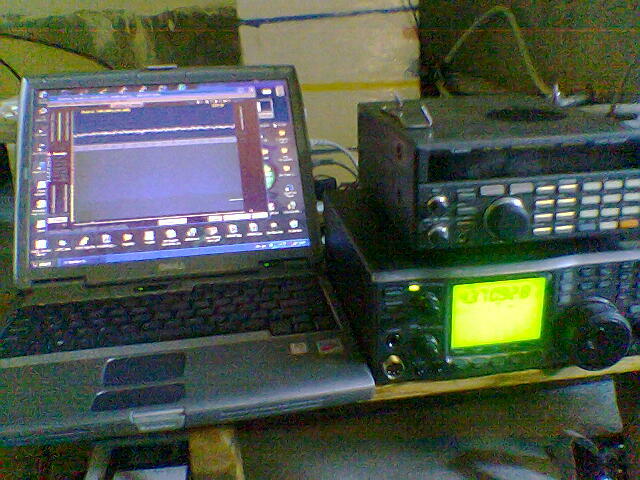 Because of doppler shift the signals where received at a freq of 437.094 Mhz. Below a picture of the calculated receiving frequency versus time. Calculations of the orbiter trajectory seen from my location and the expected doppler shift where made with the JPL's HORIZONS System. To track the spacecraft from my location an azimuth and elevation table is made. My location is maidenhead grid: JO21qk. Signals where detected on event 3 and 4 from a total of 4 events. 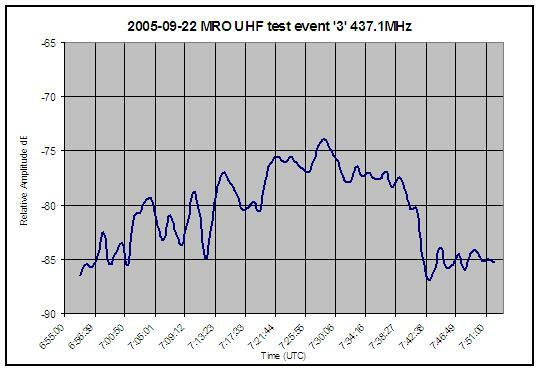 Time of detection and receiving frequency are consistent with the transmit schedule and expected doppler pattern. Note that the time mentioned in the spectrogram plots are local time. To get UTC you have to substract 2 hours. De recorded wav files. Warning fr download: Files are around 70MB!. WAV event 3, WAV event 4. Below the schedule from JPL of event 3 en 4. Time is in SCET. Spacecraft Event Time (SCET) is the UTC time at the spacecraft. So the events are observed about 46 seconds after they happen on board MRO. From the data of event 3 an amplitude graph is made. 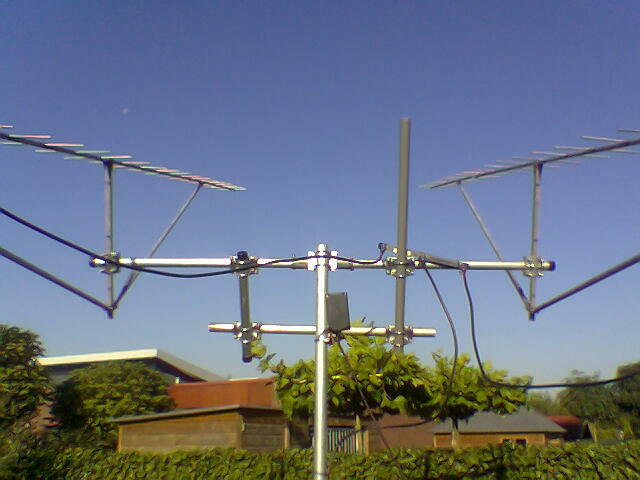 Antenna: 2x28element Yagi horzontal stacked. Polarization is linear. Calculated gain 19Dbd. 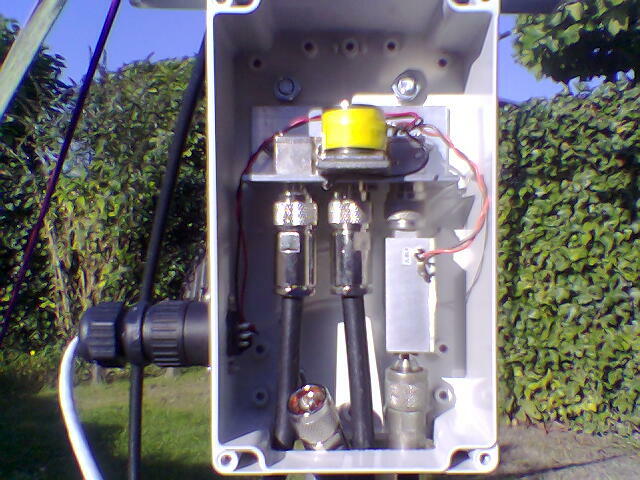 Manual Azimuth and Elevation control. Pre-amp: PHEMT fet 0,35db NF. Detection software: Spectran Version 2. Signals where recorded and post processed with Spectrumlab version 2.5. Computer: Dell Latitude D500 Laptop with AC-97 buildin soundcard system. 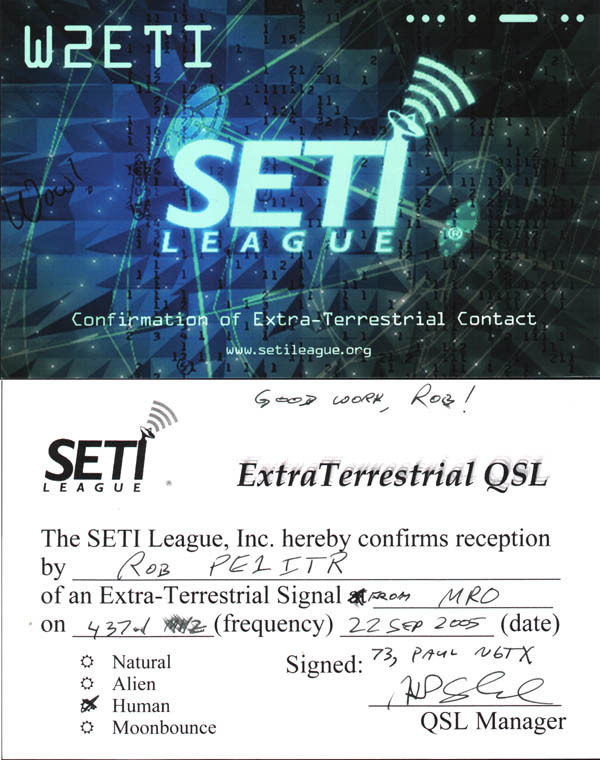 Today received QSL-card from the SETI league for the extra-terrestrial reception of the Mars Reconnaissance Orbiter (MRO).